The lazy days of summer are behind us. September brings a slew of challenges to our calendars, including back to school, sports (hello, college football), getting ready for the holidays, etc. For me, quarter 4 is always the busiest work-wise, so I have to dial down on my systems, even more, to find more time in my day-to-day schedule. Time is a non-renewable resource, so I think it’s even more important this time of year to not waste our precious minutes. Here are my top five ways to find more time in your schedule and keep your sanity as the year speeds toward its end. 1. Plan your week and your day ahead of time. Each weekend (usually on Sunday mornings), I sit down and lay my schedule out for the week on paper. This allows me to visually see which days will be extremely busy and when I have more flex time; I use this as a guide to write out the next day’s to-do list as I wrap up my work day. Getting a handle on my weekly schedule has been key for me in finding more time in my week. 2. Meal plan and meal prep. I’ve said it before and I’ll say it again, not having to figure meals out each day has freed up so much time on my calendar and eliminated a lot of stress from my life. I’m a big fan of the Prep Dish meal planning service. If you don’t want to do a comprehensive plan on your own, check out Meal Plan Rockstar to learn how to create your own seasonal meal plan and revolving pantry/shopping list. Running a small load of laundry each day allows me to stay caught up, rather than having a huge mountain to deal with at the end of each week. Also, I wash sheets and all the towels every weekend. Who wants to spend all their time on a day off chained to the laundry room? Not me. Getting in the habit of laying out your clothes and packing lunches each evening makes the mornings so much more peaceful. Because I have tomorrow’s to-do list laid out already, I know exactly what needs to go in my office bag so I’m not hunting for it on the way out. A solid nighttime routine has helped me find more time in the mornings, and I believe that a more peaceful morning leads to a more productive day. I know it sounds structured but it works. Write down the tasks you find yourself doing on a weekly, monthly, quarterly basis and put a reminder in your calendar until these things become a habit. Do not put the stress on yourself of trying to remember everything. What are your tips to find more time in your schedule? Let me know in the comments what you do to find…or send me an email at aubrey@aubreyeshaw.com so that we can have a conversation. It’s 9:15 on a Sunday morning. And for the first time in weeks, I have a lazy morning planned. So the Mister and I are geeking out on our laptops. He’s watching YouTube, and I’m trying to clear my inbox and social notifications. Of course, it’s been more than a month since I’ve written a blog post. So, I figured that I also owe y’all a quick July & August life update. We started July with the Mister having a week off work; his company always closes the week of Independence Day. My workweek was pretty relaxed as well. We decided that was the week to push hard on our kitchen updates. The cabinets and wall have been painted, and the hardware has been updated. We also installed a new microwave. Next on the to-do list is painting the ceiling and installing new linoleum flooring. I also plan to sew new curtains; the jury is still out on whether we’re going to replace the windows now or wait. We also spent plenty of time with friends at the pool because it’s summer and we live in South Carolina. After the holiday week, I’m happy to report that I made some progress toward one of my major goals for the year. I started interviewing candidates for my part-time admin position at work. At the moment, the search has been narrowed down to two really good ladies. The next step is to have the Mister sit down with us for the second round of interviews; I’m hoping his gut will help me decide who would be a better personality fit for my work-style. If there’s one thing that I learned from working with my business coach over the last 18 months, it’s that having space in my schedule for self-care is ESSENTIAL. For me, that means taking some time off. I’ve been doing that all year long by taking the last Friday of each month off, but taking a real vacation is also a priority for me. A girlfriend and I made plans to head to the Chicago jujitsu clinic. We left a 5 a.m. on a Wednesday and hit the road. I love a good road trip, and we had perfect weather for this drive. We took our time, stopping for breakfast and lunch, and reached our destination right at dinner time. As a martial artist, I love this clinic. It’s intimate and packed with great classes. Everyone is friendly, and the food. I love a clinic where they have the meals on-site; it really gives you a chance to get to know the person you’re working out with, make new friends and get some one-on-one time with the instructors. After the clinic banquet dinner, we headed to Toledo on Saturday night, and then Sunday morning we split ways to head to different parts of Michigan. My friend was spending her mother’s birthday at the lake; I was headed to my aunt’s house. Those few days in Michigan with my aunt were just downtime for me. I really enjoyed a few days with nothing specific scheduled. We hung near the house, watching baseball and catching up – though I did find a local judo club to work out with one day and visited an indie yarn shop another day. The drive home from vacation brought us lots of stormy weather. Have I ever mentioned that I dislike driving in the rain? Storms while driving through mountains or in rush hour traffic is stressful for me, but we made it home to South Carolina safely. It feels like I barely got home before heading back out of town again. The weekend after vacation was the ATJA/AJJF National Judo Tournament, and I had committed to my judo kids that I would be competing. So the Mister and I headed to Atlanta for the competition. There were 30+ states and 4 countries represented this year, and our school had 16 students entered. I’m proud to report that I placed Silver in the advanced seniors’ women’s division. 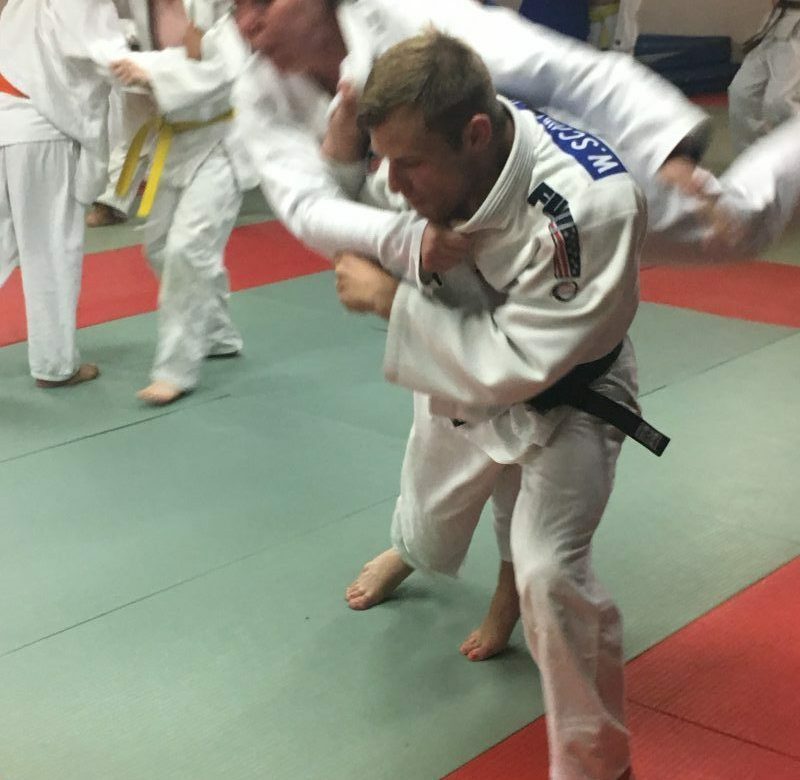 The following morning, we had the opportunity to take a class with some Olympic level judo coaches, which was super-cool and extremely challenging. August is my birthday month, but we’re staying near the home-front this year. After all the travel in July, I’m happy to stay here in South Carolina and celebrate with family and friends. Friendship has been on my mind lately. What do I need from a friendship? What am I willing to give in a friendship? When is it time to give a friendship up? I’ve been examining the power of community. How does community nurture or stunt our growth? We are designed to be creatures of community; we crave it. We need friends and want people to like us – we can’t help it. The need for community is prehistorically ingrained in us. Literally. The survival of an individual used to depend on his ability to fit in and be accepted by his tribe. If the tribe didn’t accept a person, they were alone in an environment full of danger and predators. Being an outcast was tantamount to death. Because of this need, we find ourselves emulating and changing our behaviors and way of speaking to match those around us. We are seeking the approval of our tribe. “Tribe” is a buzzword on the internet and especially among bloggers these last few years that I’ve mostly ignored. But the idea of finding a tribe of people with the same values and direction is solid. I find when I spend time with someone who has a victim mentality, I expect bad things to start happening. When I spend time around people who set goals and work hard toward them, I’m more motivated. In the last few years, I have been more selective about who I spend time with. If I choose to be focused on excellence, it only makes sense to spend time with people who are also focused on excellence. I need to spend time with people who elevate those around them, people who want to improve their lives and accomplish great things. The reality is that we accomplish more things when we work together and encourage each other. This idea was reaffirmed for me this week when listening to the Entreleadership podcast with Shawn Achor, author of the book Big Potential. In this episode, Shawn discusses a research study where people stand at the bottom of a tall hill they have to climb. Those who had to climb it alone perceived the steepness to be 20% more than those who had a friend standing there and ready to climb with them. That’s the kind of community I’m seeking in my life – a community where we pursue excellence together. By supporting each other and holding each other accountable, we all grow and increase odds of success and positive change. If you’d like to join me in pursuit of that type of community, I encourage you to join my private Facebook community: Good Vibes Only. Let’s light up the world around us.